A solar eclipse occurs when the Moon passes between Earth and the Sun, shadowing the Sun as viewed from Earth. The most intriguing fact is that Earth appears to be the only planet in the surrounding galaxies that orbits a Sun and has a Moon that can produce this marvel. When we think about light it is the Sun that we actually think about. The Sun light we see has travelled through ‘Time’ to reach us. The Sun is 93,000,000 million miles or 149,600,000 kilometers away from Earth. However, that spark of light is much, much older. Light starts its journey as gamma radiation and this electromagnetic radiation wonders around the Sun’s inside radioactive core and as a result of fusion reaction, photons are created. These photons then begin their journey, taking tens of thousands of years to be emitted by the Sun. The Sun’s light that takes 8 minutes & 20 seconds to reach the earth is in fact a ‘Time’ traveller. As you gaze upward into space, you’re actually looking backwards in time. In our symbolic language of astrology Sun is Spirit, giver of light and represents reasoning, therationalmind and leans toward dryness. The Moon is the repository and collector of the Sun’s light. It takes 1 second for moonlight to reach the earth. The Moon is Soul (Fortune) the nurturer and protector of life. The moon is in synchronous rotation with Earth. A synchronous rotation is an analogy for ‘Tidal Lock’, a one to one rotation. The moon rotates on its axis in about the same amount of time it takes to revolve around Earth — 27 days 8 hours, which is called a sidereal month. So we always see the same side of the moon; there is no “dark side of the moon.” Instead, we refer to the side of the moon facing away from the planet as the “far side of the moon. The Sun is 1,392,000 kilometers in diameter while the Moon is only 3,476 kilometers in diameter. This is a ratio of approximately 400:1. In other words, the Sun is about 400 times larger than the moon. The result of these two ratios being equal, means the Moon when central in location to the Sun and Earth, the Earth’s shadow covers the Moon perfectly. Whileindependentin theirorbitalmovements, Sun, Earth and Moon come together in an ever-moving cycle, but at a reoccurring time and place. While the Sun stays fixed and constant the Moon is swift and light, ascending and then descending. The Moon sharing equal time North and South, East and west, of the Sun’s constant path. The ecliptic is an imaginary line on the sky that marks the annual path of the sun. It is the projection of Earth’s orbit onto the celestial sphere. When the Moon and Earth’s orbital planes cross, a point is marked and this is known as the Node intersection. Sun, Moon and Earth, come together at least twice a year and this is known as an Eclipse season. Our Ancient ancestors recognized this phenomenon and it was regarded with fear! The earlySumerians, Assyrians Egyptians, Babylonian, Chinese and Greeks were amongst the first to understand the reoccurrence of eclipses. The first eclipses to beidentifiedwere the Lunar eclipses, and it was much later that the Solar eclipses were found to be the cause of the Lunar eclipses. Exactly when our ancient ancestors discovered this is a fascinating story. Some reports say this happened around 750BCE, when the legendary’Hanging Gardens of Babylon’ were created by the Neo-Babylonian King Nebuchadnezzar II, the supreme ruler of the ancient lands of the middle east. However more recent discoveries have shown that the understanding of eclipse cycles stretches much further back into our ancient past. Research indicates that the Greeks had already mastered an understanding of the ‘Saros’ cycle. It appears that the Hellenistic Greeks constructed a machine that could calculate the re-occurrence cycle of the Sun, Moon & Earth intersecting the Ecliptic.This ancient device named the Antikythera Mechanism, is an ancient analogue computer mechanical model of the solar system used to predict astronomical positions of the planets. Not all eclipses bring problematical events. Eclipses belong to families and these families were named in ancient times as the Saros series. The word Saros is assumed to have come from the Babylonian word Sarwhich is related to a time unit or cycle. However, the word could also have been derived the Greek verb Sareionwhich means “to sweep clean”. A Solar Saros series begins its journey as pale dim partial eclipse at either the North or South Pole. For the next 1200 years the eclipse travels downward or upward and across the earth’s surface. This journey of the sun shadowing of the earth or earth shadowing moon is an 18 year, 9-11day synchronistic reoccurrence. At any one time there may be 18-19 separate eclipses running upward and 18-19 running downward, with new ones forming and old ones disappearing resulting in some 42 eclipses active in this astronomical dance. An eclipse is a special Lunation. As the Sun, Moon and Earth align they set in motion a series of unfolding events. These events are governed by free will or choice. How will we choose to deal with these events as they unfold? These variable, unsettling changes are related to social consciousness. The link here is the intersection of this crossroad which forms from the criss-crossing of the Moon’s path. The crossing points are called the North and South Nodes. The closer the union of the Earth and Sun to the nodes the more spectacular the eclipse. And the more the astrological story grows. Astrology, by its very nature, is a model based on astronomy. If we accept that astronomy underpins astrology, then astrology is preordained by astronomy’s very order. And as such our collective and our own individual stories lie within this complex dance. 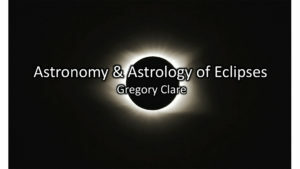 To hear more and learn how to understand and delineate this story, join us at International Academy of Astrology for a very special pocket course, The Astronomy & Astrology of Eclipseswith Gregory Clare. Friday, August 31st & September 7th. 2018, 07:30 pm – 09:00 pm, EDT, US.